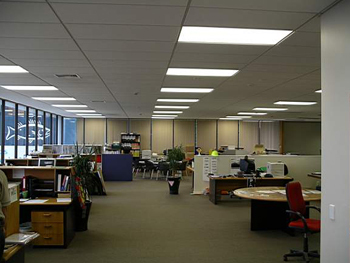 PowerTube T5 Fluorescent Lightings - PowerTube T5 Fluorescent Series Save electricity and improve energy efficiency – offered by Energy Partnership, Singapore. Do you like to Save 40% of Your Fluorescent Tube Electrcity Consumption? PowerTube® T5 series is designed to retrofit the old fluorescent system in result of high saving rate up to 52%. 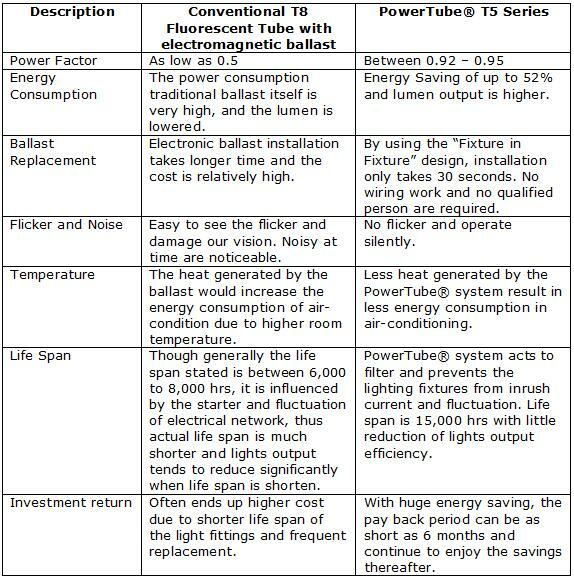 PowerTube® provides the best solution to upgrade existing fittings using Electromagnetic Ballast to the very latest T5 electronic ballast technology and T5 fluorescent lamp technology. PowerTube® provides numerous immediate and lasting benefits including: energy saving, quick installation, better light quality, eye protection and high power factor. PowerTube® T5 Series are brilliant in that no initial investment is necessary to put on T5 lighting system. By using “FIXTURE IN FIXTURE” concept, no wiring work and no qualified person is required for installation. The patented design is created by fitting a standard T5 fluorescent tube on a slim aluminium housing to form a complete unit. 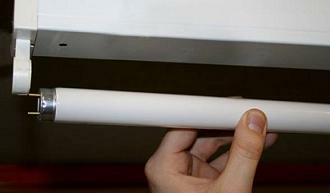 No starter is required and installation is as easy as retrofitting a normal fluorescent tube. Available in Warm White, Cool Daylight and Cool White colour. Consider the case of a commercial / industrial premise with 500 luminaries using existing lighting of 36W T8 fluorescent lamps and standard electromagnetic ballast. With the PowerTube® T5 Series T5/PT28 model we can convert the existing system to energy efficient and low cost T5 lamps and calculate the electricity costs saved by the PowerTube®. The calculation is based on 12 operation hours per day and 365 days per year. Electricity cost per unit (kwh) is $0.3045 with 7% GST. 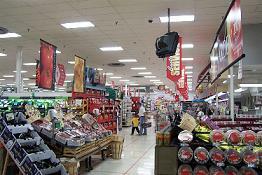 The introduction of T5 fluorescent lighting technology offers optimal lighting quality and low energy consumption. PowerTube® has considered every element of traditional lighting systems and developed PowerTube T5 Series as a solution to market demand. PowerTube® incorporate the innovative new generation tri-phosphor technology, as a result, lumen depreciation is virtually eliminated. PowerTube® has only 10% depreciation over 10,000 hours and a rated life of 15,000 hours thus reducing maintenance costs as lamps need replacing less frequently. T5 lamps use 40% less glass and 80% less mercury than traditional fluorescent tubes, as a result, less metal is used in the casing. With the use of PowerTube®, the heat from the traditional fluorescent light ballast in each unit is reduced from more than 80°C to approximately 30°C. As well as increasing the lifespan of fittings, the heat reduction will result in a positive effect on the working environment and in reducing the running costs of any Air Conditioning equipment. The American Society of Heating, Refrigerating and Air-Conditioning Engineers (ASHRAE) state that for every 3 kW of electricity saved on lighting and extra 1 kW is saved on Air Conditioning. In addition, the PowerTube® is designed with the new eye protection technology generates a high operation frequency up to 35,000 Hz. 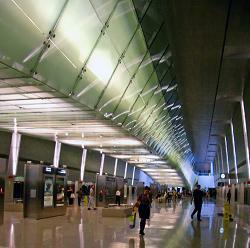 Without flickering, the PowerTube® enhanced the lighting quality and protects human vision. For Test Certificate and T5 series Project application, click here. 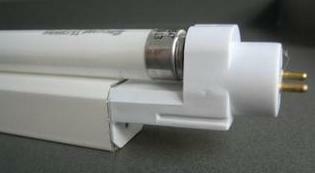 PowerTube® PT and PH model are used together with standard T5 fluorescent lamp. The product is fitted on fixture with electromagnetic ballast or without the existing of ballast. For fixture with electronic ballast or rapid start ballast, simple wiring work is required to by-pass or bride out the existing ballast. The lifespan will be shortened under high temperature operation. Please be reminded the PowerTube® should be fitted in ventilative environment. Energy-Partners™ is not responsible for any defect of the PowerTube® caused by exceeding the advised working temperature range from -20°C ~ +50°C. Please do not remove fluorescent lamp if the power is on. Please contact our office if you required further clarification or assistance. Remove the PowerTube® carefully from the packaging and check that the products supplied identity with the delivery note and the purchase order; check that the products supplied sizes coincide with the existing lamp and fixture. Check the Voltage rating of the products corresponds with the existing fluorescent lamp. Check that there are no loose parts. Make sure the existing fixture carrying ELECTROMAGNETIC BALLAST, but not electronic ballast or rapid start ballast. For fixture with electronic ballast or rapid start ballast, simple wiring work is required to by-pass the existing ballast. Note that the PT/PH model can operate without ballast. That means all existing ballast (including the electromagnetic ballast) can be removed by bridging it out. Make sure there is no Power Factor Correction Capacitor inside the fixture. If it does, must remove the capacitor before installation. Make sure the power supply of existing fluorescent lamp is completely turned off before installation. Remove the existing starter as it is not required. The electromagnetic ballast can be removed or keep inside the fixture. Fix the standard T5 tube to PowerTube® PT/PH aluminium housing. 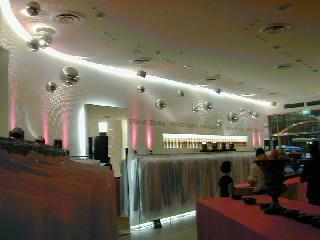 The complete unit is reloaded to the fixture. Ensure complete unit are fitted firmly. Turn on the power and the installation is completed. To ensure safety, main power should turnoff during installation. The information complies with the information contained in this publication. Energy-Partners™, or its agents do not assume any liability, expressed or implied, for any consequences resulting from inappropriate, negligent or incorrect installation, application, use or adjustment of the product or circuit design or from the mismatch of the unit to a lamp. If you are interested to order the PowerTube® or like to find out more information, you may contact us here, and we will assign an Energy-Partners™ Consultant to contact you shortly. If you are interested to implement Energy Saving and Management project for your company, please contact our Energy-Partners™ Consultants here. We owned exclusive rights to a wide range of Energy Saving and Management products. If you are interested to be our licensed distributor or Sales Representative, please contact us here.